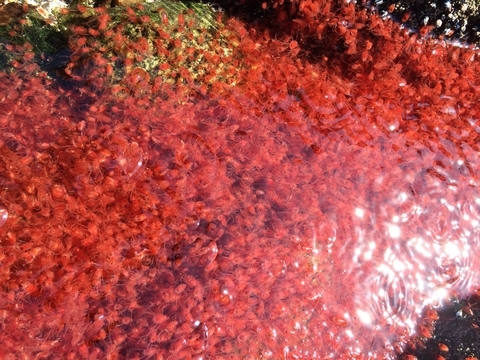 Like fish oil, krill oil is a great source of both DHA and EPA. Unlike fish oil, the form that both DHA and EPA have in krill oil is easier to digest—meaning easier for your body to use, and with less digestion troubles (like stinky burps). Both EPA (eicosapentaenoic acid) and DHA (docosahexaenoic acid) are essential fatty acids. In case you’ve heard the term “essential fatty acid” a few too many times and gloss over it a little bit, let me emphasize the “essential” bit: your body needs them. And the ocean is your main source, whether it’s algae or fish or krill that you get it from. If you’re not eating those things regularly, your body has to make them. It takes alpha-linoleic acid (ALA) and converts it to EPA, then converts that to DHA. Sound like a lot of work? It is. And if you have other problems (diabetes, allergies, an aging body…) your body might not be doing such a good job of grinding through all those steps. Let’s add another layer: you need to be getting enough ALA in your diet, too, if you’re going to make all that from scratch. ALA is found in nuts and seed (like chia seeds, kiwi seeds, walnuts, flax, and soybeans). Again, let’s go back to the “essential” part: these need to be a regular part of your diet. If they’re not, your body is probably really struggling to meet production. Here’s where an easy to digest EPA and DHA rich supplement like krill oil comes into play: it takes a lot of the work out of it for you. That’s two benefits: your body not working as hard, and having enough of something essential. Studies say there are benefits to having enough EPA and DHA. Not only do they support heart health, they may lower your risk for depression, inflammation, and more (nevermind being important for your brain!). If you don’t have an abundant source of these essential omega-3 fatty acids in your diet, it’s time to start supplementing with something like our Deep Ocean Krill Oil.